Love sewing? Or are you someone who loves to get all crafty? Finding sewing with a needle extremely troublesome? Or do you need your project fully stitched in minutes? If your answer is yes, then you definitely need to invest in a good sewing machine. A variety of sewing machines is available in the market. Whether you’re an amateur or expert, Brother PC-210 PRW is a good choice. Not sure why that is? Keep reading to find out more! 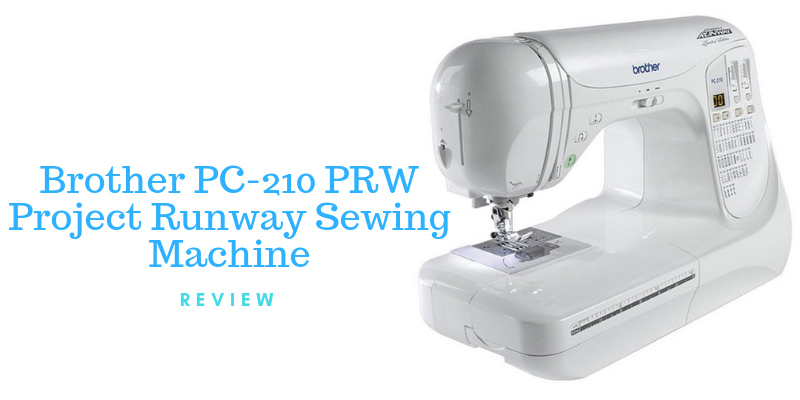 1 Why the Brother PC-210 PRW sewing machine? 10 Where to purchase Brother PC-210? Why the Brother PC-210 PRW sewing machine? Brother is a multinational, electronics company whose origin country is Japan. 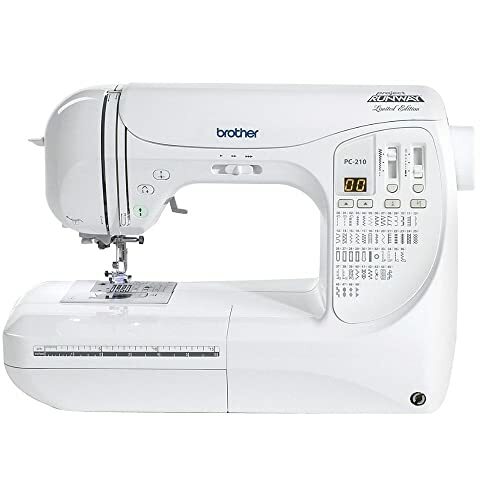 Brother PC-210 PRW or project runway sewing machine is a limited edition machine. Suitable for both beginners and experts, the machine is equipped with everything a seamstress needs! You can create gorgeous dresses, crafts and whatever else you wish, easily. This sewing machine is designed to work with a wide variety of fabrics and materials. The machine has 50 computerized stitches which make stitching a lot more fun and a lot easier! The machine features a neat and compact look along with a classic white body and smart-looking buttons. It has clean blue and black prints. An LED displays the stitch number selected. It also features a touchpad, designed to make selections. The machine weighs 17lbs. It is UL/CSA listed and works on an alternate current and a voltage of 110. It has an independent bobbin winding motor and an advanced needle threading system. Moreover, it features a 2-digit LED with a 2 cursor stitch selection. This machine has a quick-set bobbin and includes one multi-purpose needle. PC-210 PRW also has built-in accessory storage and a 25-year limited warranty. This sewing machine has 50 built-in computerized stitches. These built-in stitches allow the user to select a stitch and simply watch it happen easily. No more hassle involved in following various steps to achieve a stitch. This also minimizes the chances of error. Basically, it aims for perfection. Five of these 50 computerized stitches are the one-step buttonhole styles. These allow easy stitching of button loops. The maximum automatic buttonhole length is between 1” and 1/8” which not only helps vary buttonhole length but also provides various designs. It features the drop feed/free motion option and has 6 feed dogs. Moreover, the sewing speed is 850 stitches per minute and is completely adjustable. It lets you speed up or even slow down depending on what you’re stitching. There is an up/down needle position key which is programmable. There are a total of 14 needle positions that allow intricate work to be easily performed. It also features a start/stop sewing button to allow you to stop and start when needed without ruining your piece. You can stop when you want and then restart from the exact spot when you’re ready. An LED screen is placed to allow you to select from the built-in computerized stitches easily. It is a 2 cursor screen designed to pick from the 50 pre-set stitches. A touchpad operation panel makes selecting even easier. It also gives the machine that trendy, classy, and new look. Similarly, it saves time that is otherwise wasted on going through lengthy menus to pick what you need. It also aids fast, smooth, and convenient sewing! The quick-set bobbin reduces the hassle of fixing the bobbins in place. The bobbin immediately snaps into place on its own. This also reduces the chance of ruined stitches and clusters of thread that hinder smooth sewing; a sight that is common, when the bobbin is not placed correctly. The presser foot of the machine is easy to level. A large, lighted work area ensures accuracy and ease in stitching. The automatic needle threader discards stress involved in threading needles. It also helps save time and also erases the fear of getting pricked by the needle. The automatic thread tension control makes sure the thread is not too taut and vice versa. It ensures smooth stitching and prevents your piece from getting ruined by a bad, pulled stitch. It also prevents the breakage of thread in the middle of sewing by adjusting tautness automatically. Automatic reverse stitching allows the backtracking and locking step to be performed with more ease. The machine also has a built-in, carry handle which makes it portable. It also features a compact design that is easy to fit into small spaces for easy storage. Overall, this sewing machine features almost everything. You can purchase the free motion quilting foot in addition to other feet already included. It is optional but an added tool that this machine offers. This ensures ease of working and you can start and stop when you want. Immediate response on pressing the button prevents the cloth from getting ruined. The machine has an interactive manual and a user-friendly setup. This makes learning and working with it easier. It has been specially designed for use by all types of individuals. The machine is quiet during operation. It makes no noise while you work on it which allows you to sew even when everyone else is sleeping. Unlike with other machines, even listening to music while working on this machine is a pleasant experience. The machine is smooth during its operation. The stitches are perfect, and there isn’t any sloppiness. Thus, it makes stitching hassle-free as you sew your piece perfectly in one go! This machine makes buttonhole stitching a few-second process. The process is fully automatic and easy-to-create. Plus, you have five designs to choose from! Since the machine is compact, you can store it in small spaces. The handle makes the PC-210 easy to move about. Now, you can stitch in your favorite spots easily! Not only does this machine have a large workspace area, but it is also lighted. It has 2 LEDs attached to make working easier. As a result, it allows accuracy as you make markings and stitch. A larger area allows for easy rotation and handling of the cloth. Although the machine has a lighted work area, it isn’t very bright. The 2 LEDs fail to light up the workspace for use in a dark room. Even though it is a great option, it is difficult to adjust to. It may take a while before the user grasps the functioning of this feature. The machine can only work with bobbins that are specifically designed for it. Thicker bobbins have been made compatible with these machines, unlike thinner ones which are readily available. A single needle is provided with the machine. Although multipurpose, an extra needle or two would be a life-saver if the one being used breaks. The machine can only work at a voltage of 120 in AC. Although portable, the machine cannot be taken on holidays. Some countries do not have electricity settings that are compatible. It has also been recommended to use it at the stated current even if you have an adapter. It comes with a long 25-year warranty. No more worrying about damage when purchasing the machine! Brother provides a 1-year warranty on machine parts and labor. Meanwhile, it offers a 2-year warranty on electronic patterns and selection pad/buttons. The 25-year warranty applies to shafts and rods that are part of the machine head. Where to purchase Brother PC-210? Brother is a popular electronics brand which makes it simpler to find its products online and in markets. 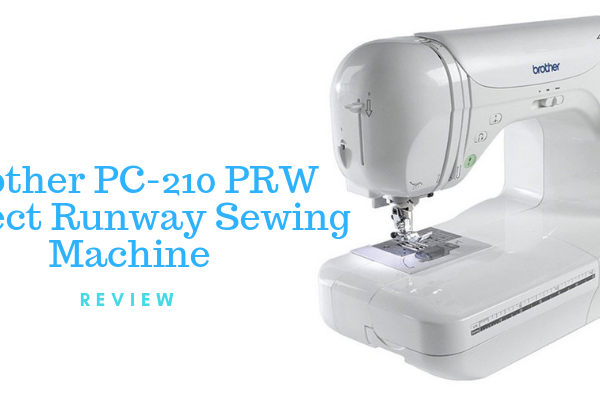 Their limited edition sewing machine, namely the PC-210 PRW is a popular product of the project runway line. This makes it even easier to find this sewing machine in a variety of online shops. Of course, it is also available on Amazon. Conclusively, the Brother PC-210 PRW sewing machine is feature-rich and up-to-date. It’s a great tool suitable for both beginners and experts. It has a good learning curve which makes its functioning, easier to grasp. Moreover, it comes with a 25-year limited warranty which discards worry about parts and machinery. Plus, the machine is not too pricey for the number of features it offers. The machine comes with its own set of accessories with a variety of feet and is both compact and portable. However, the voltage supply is a minus. You cannot simply plug in anywhere even with an adapter available.